Pet Transport to and from Sydney, Brisbane, Adelaide, Melbourne, Canberra, Hobart, Perth, Darwin or anywhere in Australia. Overseas Pet Transport - Yes, we provide international pet transport too ! Coates Pet Transport was established in 1998 because we noticed lots of people were looking for a "pet transporter" in our local area. Since then we have helped hundreds of people get their pets from "A" to "B". You need to take your little darling to the vet, but can't drive there yourself? 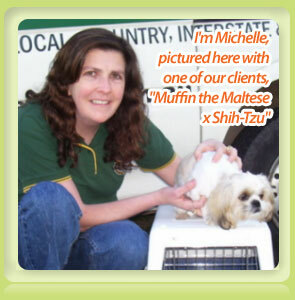 You're going on holidays and need someone to get your pet to a boarding kennel, cattery or pet-sitter? You are a breeder and you need a dependable way to deliver animals you've sold? We can transport any small domestic animal around the greater Sydney region in our comfortable air-conditioned van, and yes, you can accompany your pet if you wish. If you need to send your pet from Sydney across Australia, we have agents in all Australian capital cities. Sending your pet across the world? No worries! We are your pet's travel agent. We can book them on a flight and get them to the closest airport. At Coates Pet Transport we understand that your pets are not just animals - they are your family. The comfort and safety of your pets is our utmost priority.